Great news! Google Jamboards are now available to purchase in the UK. Netpremacy was the first Premier Partner in the UK to be able to offer Jamboards. We have built a state of the art demo suite that is available in our Leeds HQ for customers to come and experience the Jamboard first hand. 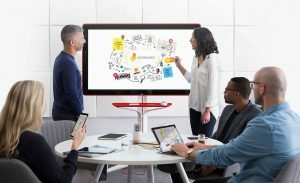 The Jamboard has a custom designed stand, on wheels, that can be easily rolled to wherever is needed, and is already preloaded with Google’s cloud-based collaboration app, G Suite. Presenters can pull documents directly from Gmail Google Drive, Google Docs, Google Sheets as well as many other apps. Jamboard makes enterprise collaboration more intuitive, and free of interruptions through a human-centric design and touchscreen technology. Supported by low-latency technology that allows for 12 simultaneous touch points at once. Jamboard effectively enables businesses to collaborate in a smoother method online, across all areas of the globe. The HD 55” 4k touchscreen ensures that no detail is missed. With such advanced technology and software, there is no lag in the pen when drawing, making the sensation of drawing as smooth as if you were actually writing on a real whiteboard. 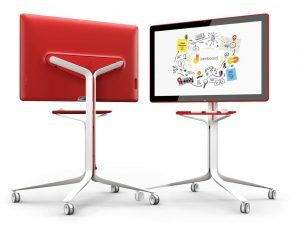 Jamboard offers a versatile range of features to facilitate effortless creation. A powerful toolbar features advanced creation tools that include handwriting and shape recognition. 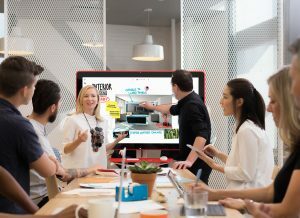 The creative way of working that Jamboard provides allows for an easy flow of ideas, and the online feature means that you can collaborate with several of your team members at the same time. The Jamboard has great features such as a HD camera, speakers and Wi-Fi, making it easier for corporate collaboration in real time, whilst simultaneously pulling referenced materials directly from the web. Jamboard allows several people to contribute in real time across multiple devices. There is no longer the need to write notes around your meeting, the Jam will save and can be sent to all collaborators following the meeting. Saving you time, and leaving more time free for greater productivity. The handy video conferencing feature helps to bring the whole team together to unlock their collaborative creativity. Jamboard is a collaborative, digital whiteboard that is built especially for the cloud meaning that content sharing is intuitive and secure. It is easy to add participants to your jam, by using their email address, or alternatively you can export your creation as a PDF image. Come and try them out for yourself! We have the best demo suite in the country ready to show you exactly how a Jamboard works. Contact us on info@netpremacy.com for more information on pricing and demos.